Velma H. Harding, 91, of Gautier, MS, passed away at her home on Monday, July 16, 2018. Velma was born to the late Jasper and Maudie Hodges on February 23, 1927, in West, MS. She was married to the love of her life, Robert Norman Harding, for 36 years. Velma retired from Ingalls Shipbuilding after 24 years in 1995. She was a devoted wife and mother, and she will be greatly missed. In addition to her parents, she was preceded in death by her husband, Robert N. Harding; brother, George Hodges; sister, Gene Sylvest ; son, Ronald N. Harding; daughter, Velma E. Frazier; granddaughter, Crystal Harding; and grandson, Jimmy Harding. 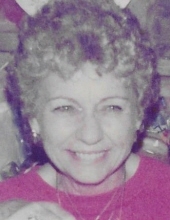 She is survived by her daughters and their spouses, Billy and Carol Garcia, Douglas and Cindy Phillips, Ibrahim and Bobbie Sirin; daughter- in- law, Evelyn Harding; grandchildren, Christina Harding, Stephanie Fields, Angela Roberts, Olivia Phillips, Jennifer Paulk, Daniel Frazier, Briana Perez, and Brock Phillips; 19 great-grandchildren, 1 great-great grandchild, and numerous relatives and friends. The visitation will be held Thursday, July 19, 2018, from 9 a.m. until 10 a.m. at Heritage Funeral Home in Escatawpa, MS. The funeral service will follow in the funeral home chapel. Interment will immediately follow at Jackson County Memorial Park in Pascagoula. To send flowers or a remembrance gift to the family of Velma H. Harding, please visit our Tribute Store. "Email Address" would like to share the life celebration of Velma H. Harding. Click on the "link" to go to share a favorite memory or leave a condolence message for the family.